Tomorrow I'll be heading back to Ottawa due to some professional commitments. Dave and my dad will be staying to finish the last two days of training with Lynyrd. Leaving early means that I miss the St. Jacob's market (which I loved last time) and the practice public access test (which makes me nervous). St. Jacob's is disappointing but I'll live. It's the practice test which I'm obsessing over. Lynyrd is a great dog and he's responding well to me, but I rarely have confidence in my ability to perform under evaluation. I know I can do something perfectly a dozen times and then mess it up once it's important. But, as I keep reminding myself, NSD wants us to succeed and will work with us. I've got my to-do list for when I get home. Mainly daily practice of food refusal, ball ignoring, and the halt command with Lynyrd. Almost everything else will get used in regular practice, but those three are unpredictable and important to get right even when spontaneous. So I need to make sure Lynyrd's skills stay sharp. My wish list of things to work on include: going to the mat automatically when the doorbell rings, practicing "hide and seek" and "find Alex", and a remote halt command (not sure if that one is possible, but I'm hopeful). Possibly also a "cuddle" command, which would be like the "visit" or "over" command but more of a lean in than a deep pressure. But any new tricks will have to wait until Lynyrd is settled. He was named after the band, so we've been calling him Mr. Skynyrd when we want to be formal. He's a very different dog than Icon, in terms of personality. Lynyrd is more attentive and eager to work, but far more easily distractable than Icon was. Luckily, he comes back to us almost immediately, without much correction. Lynyrd is a "grin" dog, who always seems to have a smile. Though you can't see it in this picture, he has a white blaze down his chest and a little fringe of white around his lower jaw. I think that will help Alex a lot when it comes to distinguishing between Lynyrd and Icon. The two dogs are about the same size (within 2 pounds of each other) but Lynyrd is not the biggest dog in the class. We have two monster sized fellows, each between 95 and 100 pounds. The training is different as well. Different aspects are being emphasized and some changes. Last time we were told, don't worry if your dog eats grass, it helps with their digestion. This time, we've been encouraged to stop them grazing. There are areas where we obviously got sloppy in our follow-through as well, because we're having to work hard to do it properly (mostly with repeating commands rather than doing the ask once, verbal correction, physical correction structure that we're supposed to use when the dog isn't listening). It's been bittersweet. Lynyrd is a great dog, but being around so many black Lab mixes inevitably reminds us of Icon and how much we miss him. We've gotten an update that Icon is very happy and settled in with his puppy-raiser who is over the moon to have him with her. We're happy for him, but sad for us. It helps that Lynryd is such a different dog, and he's definitely creating his own space in our hearts. I'm much calmer than I was yesterday at this time. I spoke with our behaviour consultant and she is fairly confident that we can manage Alex's attempts to headbang on a window without increasing headbanging in general (or targeting the window specificially). We need some information from the school first, in order to formulate a plan. Information like, how often has he targeted a window, is there a trigger/environment which prompts a window instead of another possible surface, is it a single headbang or is it part of a tantrum? Once we have that, then we can figure out a plan for redirecting Alex to prevent him from targeting a window, without making him feel as if he's being thwarted in his intentions. After last week's meeting, I was feeling better about Alex's school for this year. Yesterday, I got a note which has ramped up the anxiety again. During the meeting, they mentioned that Alex had once tried to headbang against a window the previous year. The school was concerned about breakage and possibly severe injury and wanted the window to be an exception to the "don't intervene and ignore the behaviour" protocol. I was nervous about that but thought "It was only once and he never targets windows at home or when we're out. It shouldn't be an issue." He did it again at school yesterday and so I got a note about how this behaviour will be addressed when the team gets together to develop his safety plan. Now, I understand the school's concerns. Windows are not like walls and Alex can and does hit his head hard enough to damage drywall. But at the same time, once Alex realizes that he gets attention for targeting a window, he's going to start doing it more and more so that he gets the reaction. I've brought in our behaviour consultant to see if there's a way to discourage choosing the windows without encouraging the behaviour. I can't think of one but hopefully she can. This week was the deadline for deciding on Hallowe'en costumes for the boys so that I'll have time to sew them. Nathan wants to be a Starfleet officer. And Alex does not want a costume. It was a surprise for me. He wants to stay and hand out candy and not wear a costume. It's a little disappointing. I love Hallowe'en and cosplay, but I'm also pleased that he's communicating what he wants rather than just going along with me. I guess that despite his enduring love of the Wiggles and Teletubbies, my boy is, in fact, growing up. So what do we want to work on? Alex is fairly good at getting himself dressed and is doing well with eating regular food. We could work on table manners and independent personal hygiene (ie washing himself, brushing his own teeth and hair). Both of those will affect how people interact with him long term. He likes being with people, so maybe we should work on appropriate social interactions (ie, only saying hello once and not demanding endless streams of French-English translations). Or maybe we should work on getting him involved in some kind of organized sport (swimming or track and field would be my top picks). He's an active boy and will likely need that kind of activity throughout his life to stay on an even keel. Here's the thing. We likely will only be able to tackle one of these. So which one is the priority? There's no right or wrong answer. It's a matter of deciding where to put our effort. Luckily, we have some time to think about it since I won't be starting anything before the new dog arrives in October. National Service Dogs posted pictures of the fall graduating class on their Facebook page. One of those dogs will be coming home with us in September, so we're pretty excited about it. We know there are 6 families participating in the fall training and since there are 8 dogs in the class, I'm guessing that 2 of them are PTSD dogs. We've decided not to show Alex the pictures in advance. We don't want him to get fixated on one of the dogs and then have a problem if that isn't the one assigned to us. With 6 black Labs and 2 chocolate ones, it looks like the odds are in our favour to get another black lab, like Icon. I'm not sure how I feel about that. On the one hand, they're all adorable, but on the other, is it going to be hard to see the dog as themselves instead of as not-Icon? I guess we'll find out. 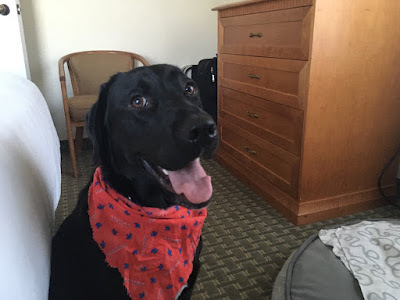 And now it's time for my not-so-subtle, shameless promotion side: if you'd like to donate to National Service Dogs you can do so here. They don't get any government funding and rely entirely on donations to cover the $ 30 000 cost of raising and training each dog. The families don't have to pay (although we are encouraged to fundraise, which is why I'm sharing this with you). These are some really hard-working people who care a lot about the families that they help and the dogs that they raise. So please spread the word so they can get the support that they deserve. On Wednesday, we had our meeting with Alex's teacher, EAs, the learning support teacher and the vice principal. It ended up going very well. They had read the behaviour consultant's report and had some good questions. For example: what to do when Alex uses aggression to get out of a task? At that point, there are two conflicting behaviour goals (put Alex in a time out for the aggression and make him complete the task). I explained that we used a diminishing reward system in those cases. We would do the time out, then go back to the task, but now the reward for completing it is a less preferred one. I was also able to go through our behaviour recording system and show them how easy it is to make notes. Having this kind of data collection will make it much easier to track any issues and I should be able to catch problems well before they escalate. There was some uncertainty about the baseline levels for head-banging. I explained that at home, the vast majority of the time we have no head-banging and even on a very bad day, we don't go above 3 incidents. They pointed out that school is different with more demands, which I can agree with, but I still believe that if they follow the protocol, they will see similar results. He'll find other ways to protest, but the head-banging should be reduced. The other thing which made me nervous was their insistence that if any staff feel that the head-banging is unsafe, the staff will have the full support of the school to intervene. On the one hand, I can recognize why that condition needs to be in there since the "common sense" rules don't apply to bureaucracy and I don't want anyone to get in trouble for doing the right thing and stopping Alex from hurting himself. On the other, I know that we had an issue last year with a staff member deciding that any head-banging was harm and thus they were going to intervene in all of it (which is what lead to the problems). But in the end, the data collection will let me keep track of that and deal with the issue down the road. So I will wait and see how it all plays out. Autism is definitely getting more pop culture references these days, which I can appreciate. But it still bothers me that so many of those references fall into one of two categories: the jerk and the superpowers. There's a new show "The Good Doctor" about a doctor with autism who is super brilliant. Dave and I have been on the fence about whether or not to watch it. On the one hand, we feel that we should and we generally like medical procedurals. But on the other, it can be hard for us if they portray autism incorrectly and even harder if they get it right. We will probably give it a try and see how it goes. Shows like this make me wonder if ten years from now, autism will be an accepted part of the landscape. Or will it be last year's trend, replaced by whatever new condition is considered hot? Those who follow the blog know that Alex had a difficult year with a lot of behaviour issues at school last year. So far this year, he's had two days with significant number of headbangs (more than 3, which I would consider the expected limit for a very bad day). Two out of five is not a reassuring total. Hopefully this is something of an extinction burst, where he's trying to see if he can get the teacher and EAs to back off the number of demands that they make of him. After all, it was a very successful strategy last year (from his perspective). But if it is an extinction burst, that makes it even more critical that everything is consistent. Otherwise, we're only teaching him to escalate his behaviour to get what he wants. I have a meeting tomorrow to discuss it with them. I don't like confrontation, but at the same time, I did the "wait and see/understanding" route last year and the problems only continued. This year, I have to be more active. Over the last six months, Alex has been asking to be a "DQ Employee." He was counting down the days until he turned 16 and would be eligible for a part time job. This weekend, Alex and my father were at Carlingwood, at the manager at the DQ recognized him, greeting Alex by name. Then he asked the magic words: Alex, would you like to make your own sundae? There was a very enthusiastic affirmative from Alex (once he understood). Under the direction of an employee, Alex used the soft ice cream machine to make his sundae, finishing it off with a little curl. So a big shout out and thank you to the DQ at Carlingwood mall for making Alex's year. We'll see if he still wants to be a DQ employee or if that wish has been ticked off his list for now. But either way, that meant a lot to us. Yesterday was very hard for all of us. After supper, Dave took Icon to Kingston to meet with the NSD representative. Icon got hugs and treats from all of us. We've been told he's going to stay with his puppy raiser, who had him for his first 18 months. We've spoken with her in the past and she seems like a lovely person. We know Icon will be happy with her and that she'll love him the same way we do. But it's still hard. I hope we'll have a chance to see him again. Our thoughts are with him. The first day of school went reasonably well for Alex and Nathan yesterday. Per Alex's teacher, there were some bolting incidents, but no headbangs, so that's reassuring. Nathan has the same teacher as last year, so that should go relatively smoothly. I got some writing done. Which made me feel happy. I think it's going to be a long while before I can completely relax in terms of school. It was such a rough year last time and there was a real gap in communication. But it's a new team and I've been proactive in getting things set up, so realistically, I've done all that I can. Which does not sit well with my inner control freak. That little demon wants hands on surveillance and a guarantee. But she'll have to live without it. Today is Icon's last day with us. Over the last week, Alex has begun asking for "Icon to stay" instead of "No new dog" which breaks our hearts even more. Hopefully he'll bond with the new dog as well. Tonight is going to involve tears and chocolate. Biggest high: Alex made it through the summer with only one small accident. He is still independently toileting. I think we can finally call it: he's toilet trained. It's been 12 long years of trying everything we could think of, but the real praise goes to our behaviour consultant, who has spent the last 3 years coaxing him toward this goal. Now that toileting is done, we'll actually have the mental space to work on other goals. 2nd biggest high: our newest four footed furry member: Neelix. I'd been searching for a kitten for quite awhile, so that Nathan could have someone to focus his attention on instead of the service dog. Enter Neelix, a domestic short hair with tabby stripes and a huge, playful personality. She's adjusted well to our household, including the dog and our older cat, Ceili. Ceili still doesn't like her but is willing to live and let live. The dog would love to play, but Neelix is a little shy about it, considering the dog is almost 100 times larger than her. 2nd biggest low: continued health problems for me. I've had a summer of adjusting medications, incredibly low energy and painful cramping. There's no real end in sight right now and I'm having trouble coping with the depression, which is why I've been silent. I've spent the summer working with our education consultant to get Alex's IEP in order. It had gotten messy with all of the changes last year and some information got lost. Alex has a new teacher this year, so hopefully he'll do better than last year. Nathan has the same teacher as last year, which should hopefully mean another good school year for him. I got an invitation to an exclusive writers' retreat for October, which I am very much looking forward to, since I am behind on my deadline for the latest book. The trip to Calgary went reasonably well, but was considerably more draining than I'd expected. The kids had trouble while we were there, but have been asking to go back so maybe a second trip will be more successful. I'm hoping that I can post more regularly now but I'll ask for patience. Thank you to everyone who reached out to me to pass on good wishes and concerns.